My wife found this female black jumping spider, called the bold jumping spider, Phidippus audax, in our living room a couple of days ago. Rather than return it to the outdoors right away, I kept if for a few days and after feeding it 4-5 winged termites I set the spider inside in the living room in full sun on top of a leaf. The spider calmly modeled for me for about 1 an hour without trying to escape. The larger jumping spiders are really a lot of fun to work with they are very curious and never get aggressive. I tried getting the spider to sit on my finger but it would not stay on the tip long enough to get a shot of it. I shot this at 1.5x with a very compact set-up, Sony A6300, Minolta 5400 lens, E-Mount to M39, one Canon M39 tube and Raf 39mm to RMS and RAM to Min5400 adapter. Handheld with Godox TT350, custom bracket, custom diffuser. 1/160th, ISO100, flash at 1/8th power. This set-up was super easy and simple to use. Robert, generally speaking I like the light, but that reflection in the eyes shows without a doubt the most bizarre diffuser I have ever seen. Can you explain further? Yes, I like the soft light the diffuser and flash combo makes but the reflections are strange I agree. The Diffuser is a oval shaped. The reflection is not a full oval since part of the leaf that the spider is on is blocking the left side of the diffuser. There is round shape in the reflection inside the oval reflection, this is since I use a round translucent disk inside the diffuser to spread the light and stop the flash from creating a center hotspot. Next time I need to use a sheet type diffuser or add a flat sheet under this one. Very nice shot. 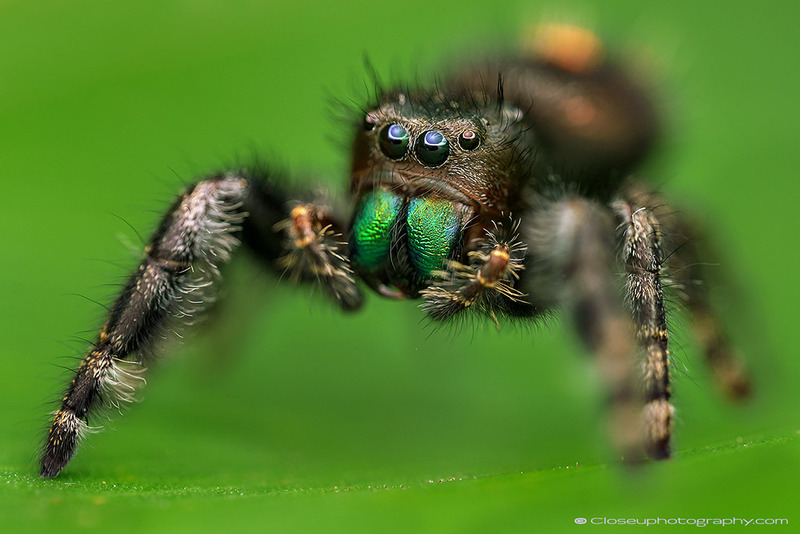 These spiders are a lot of fun to photograph, but they are not always willing to cooperate. Sometimes it can help if you can give them a little snack to distract 'em while you shoot. In this case I fattened her up with 4-5 winged termites so she was fat and happy to model for a little while.